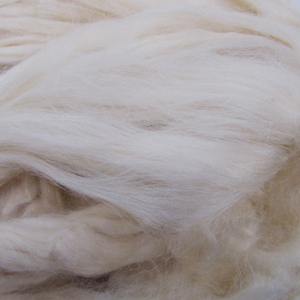 ﻿ Merino Mulberry Silk Fibers from Weaver Creek Fibers, wholesale purveyors of luxury fibers. This Tussah Top is finer than what most Western Spinners have the privilege to handle. It is a pale golden color, much like that of a towhead infant. It is just magnificent and ultra soft. Tussah silk is the product of the tussah worm of India and China, which feeds on oaks. It is now semi-cultivated, as groves of dwarf trees are provided for its feeding. Tussah Silk has a beautiful natural shine and it is very durable. Tussah silk is produced by tussah silkworms and while it is usually a beautiful natural golden tone it can vary from pale cream to a dark rich brown. Tussah silk caterpillars eat oak leaves or other leaves rich in tannin and it is the tannin that gives the color to this silk. Most of species of tussah silk moths are found in China, India and Japan. These moths are large and have a prominent eye marking on their wings. The caterpillars are bright green.